Put simply, a live view LCD on a digital SLR camera lets you preview the photo you're about to take using the large LCD on the back of the camera. 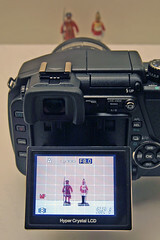 This provides you with a second way of composing your photos - the first would involve looking through the viewfinder. A live view LCD is great for people who don't want to be limited to viewfinder composition, and enjoy taking photos from the hip, high up, or from odd angles. The continuous image displayed on the LCD helps you ensure that you're getting the composition right, even when your eye isn't pressed to the viewfinder. But hold on a sec...this "special" feature sounds an awful lot like the way every compact digital camera works. 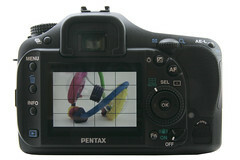 It is, but adding a live view LCD to a digital SLR is not quite a simple as it sounds. Why Don't All SLRs Have Live View? In order to answer this question, you have to understand how a digital SLR camera is put together. 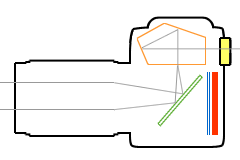 When you're not taking a photo, the light passing through the lens strikes a mirror (green) that sits in front of the digital SLR sensor (red). This mirror reflects the light up into a pentaprism (orange), which in turn reflects the image so that you can see it in the viewfinder (yellow). The huge advantage of this mirror system (vs. the electronic ones included in compact cameras) is that there is zero image latency. Image latency is a term that is used in conjunction with video displays when there is fast-moving action on the screen. Since video displays can't keep up with really fast movements, they blur (or "ghost") images. Image latency makes it hard to track a fast-moving subject. Imagine trying to take photos at a sporting event or of a jackrabbit with a screen that keeps blurring the display. Since no electronics are used to display an image in the viewfinder of a digital SLR, you can whip the camera all over the place and never lose track of your subject in the viewfinder. Unfortunately this display comes with a price. Compact digital cameras are able to display a live preview on the LCD because when you turn the camera on, the sensor inside the camera activates. Since there is nothing in between the lens and the sensor, the sensor picks up light and immediately transmits images to the LCD screen. Can you guess now why a digital SLR camera can't do the same thing? If you said "there's a mirror in the way!" then you've found the right answer. The only time the mirror moves out of the way is when you press the camera's shutter release button to take a photo. The rest of the time, the mirror blocks the sensor so that it can reflect light up to the pentaprism and viewfinder. With no way to collect light, the sensor CANNOT display a preview of the image you're about to take on the LCD screen. In 2006 Olympus introduced a camera called the E-330. While comparable to other digital SLRs in many respects, the E-330 included one stand-out feature: a live view LCD. How did Olympus pull this off? The answer is pretty simple when you think about it: they just added a SECOND digital sensor in the path of the light reflected by the mirror. The second sensor captures the image that is being reflected up to the optical viewfinder and then transmits that image to the camera's LCD. Voila! A live view LCD screen on a digital SLR camera - the first of its kind. Panasonic was soon to follow (it's no surprise - they're partnered with Olympus) and followed on the heels of the E-330 with the DMC-L1. 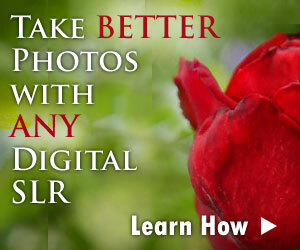 If you compare modern digital SLR cameras, you'll find that every new model includes some type of live view system. However, not all live view systems are created equal. The main issue that plagues most live view systems is one of speed: autofocus is slow, and the time to take a photo is downright glacial. In the paragraphs above, I mentioned that there's a mirror in the way of the digital sensor and that this mirror needs to be out of the way in order for live view to work. Unfortunately, that same mirror is required for the sophisticated autofocus system to activate. So what happens when you try to autofocus a digital SLR in live view mode? As if all this weren't enough, autofocus in live view often requires the use of a different button besides the main shutter release. When you're not using live view on a digital SLR, you engage the autofocus system by pressing down halfway on the shutter release. The autofocus fires up, and beeps once the subject is in focus. With many live view systems, you can't use the shutter release to engage the autofocus - you have to press a separate button on the back of the camera to get it to work. So what's the main takeaway point from all of this? Live view mode is only useful for static subjects, not subjects in motion. On the plus side, this technology is already starting to improve. For example, both the Sony DSLR-A300 and DSLR-A350 take the live view mode to the next level: the autofocus engages when you press down on the shutter release (just like normal mode) and there is less mirror flipping, which improves camera performance significantly.